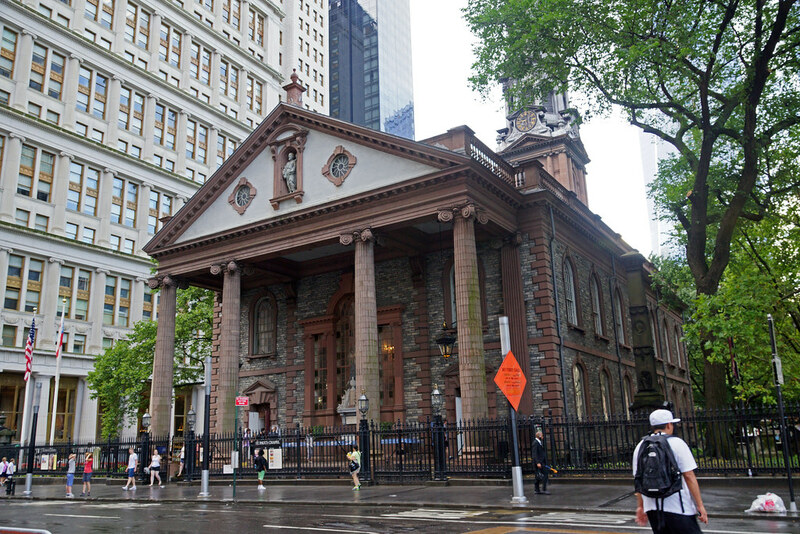 La Capilla de San Pablo (en inglés: St. Paul's Chapel) es una capilla histórica ubicada en Nueva York, Nueva York. La Capilla de San Pablo se encuentra inscrita como un Hito Histórico Neoyorquino en la Comisión para la Preservación de Monumentos Históricos de Nueva York al igual que en el Registro Nacional de Lugares Históricos desde el 01966-10-15 15 de octubre de 1966. Es el edificio religioso más antiguo en Manhattan. The chapel gave rest, hope, peace and sometimes you can just a hot meal to those who served tirelessly and endlessly after 9/11. It is truly a sacred and referred place. I love how it is become a memorial to the men and women I gave everything to try and help others. It even serves as a reminder to us all of the ongoing trials that many of the rescuers have, both with their body and their mind. I've never felt such reverence as I felt in this church. I've had 3 visits to NY, and all 3 times I've visited this church. I can't imagine a trip to NY and not stopping here. Paying respects, questioning my own mettle, thinking of the bravery. First responder do just that, they respond. They help. They give everything. And St. Paul's is an ongoing reminder that there are men and women, not just on 9/11 but every day, who are willing to sacrifice their lives for each of us. God bless the men and women who gave their lives and the others who tried to find some peace, rest one comfort while working the pile. The view from the back of St. Paul's Chapel in 2009 was of cranes and building site in the background is the World Trade Centre site. It's a miracle this beautiful little chapel survived that day. Amazingly this church survived destruction from the resulting falling towers during 9/11 because of a tree in the back courtyard saved the chapel from being crushed. It then played a huge part in housing workers and fire and rescue men and women who we working tirelessly at ground zero. They would come and rest at the chapel instead of going home when they were tired so they could be close if needed. They would lie in full gear and sleep on the pews and their equipment would scuff up the wooden benches. These can still be seen today as a mark or respect and tribute to those brave men and women and also to those who lost their lives that day. This chapel is a beautiful and powerful little place! Came here a couple times when I lived in NYC 6 years ago. The Little Chapel That Stood is a definite must stop for anyone who's interested in it's history and it's role in the 9/11 emergency personnel's rescue efforts. I highly recommend it!! I visited years ago, and just stopped back in to see if things had changed. They removed the pews in2016 for an anniversary of the church. This is the place that housed and cared for so many rescue workers. It’s a beautiful smaller church with a graveyard in the back. beautiful downtown church with handicapped accessible entrance on the side. completely wheelchair accessible with ramp. they also give out food to the poor but it gets very crowded.